Bridesmaids: Bridesmaids dresses are made to order and are not returnable or exchangable. All other formals: If you are not completely satisfied with your order we do accept returns for store credit or exchange within 24 hours less a 10% restock fee for any in stock dress. A 15% restock fee applies to any replacement dress that needs to be special ordered. If you cannot find a replacement dress we do offer a refund minus a 20% restocking fee. Your dress is often ordered from the manufacturer and cannot be returned to them, so please be sure to measure carefully because you are responsible for the size you select. If an item has to be ordered with the manufacturer, once the order has been placed, even if it has a future delivery date it cannot be cancelled and the restock fee still applies. * All returns must be unworn with all tags attached and be in the same packaging that it was received. Also the items must be free of stains, makeup. odors (perfume, cigarette smoke, etc.) other damages, or alterations. Anything returned with the mentioned problems will result in the the full amount of the item being charged to the customer. Returns must be returned within 3 business days of issued RA#. To request a return please call 866-679-2383 or email sales@firstimpressionsprom.com to request an RA#; this must be done within the first 24 hours of the item being delivered. Once an RA# has been issued the item must be back into our store within 3 business days. Customers are responsible for the return freight and insurance back to our store; any item being returned to us not insured that is lost while in transit is the customer’s responsibility. We accept Visa, MasterCard, Discover and PayPal. We can also accept American Express through paypal if desired. 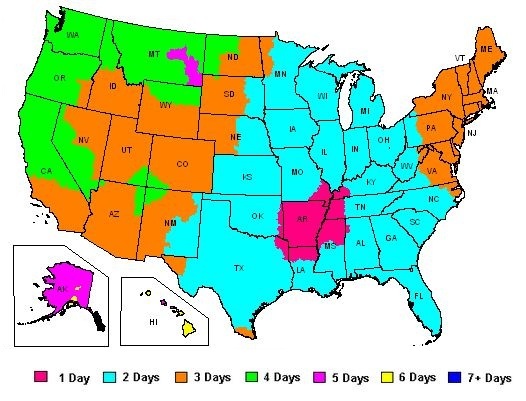 Sales tax is only applicable if you live in the state of Arkansas. If you are an international customer you will need to pay using our PayPal option. Also we charge a flat $100 fee to ship internationally so please choose that option when placing your order. If you need your dress quicker then standard ground please email us so we can help you with the extra cost for 2 day and next day deliveries. Please note that we also offer the option to pay via western union wire transfer if you do not want to use the PayPal option, you may email us for details concerning the western union payment option before placing your order. Most items in stock will ship out in 2-3 business days; if you order a popular size or color that is not immediately available to ship which has to be ordered from the manufacturer and you are not comfortable with your dress coming in closer to your actual wear date you may consider choosing a sooner wear date (required at checkout) to give you time to find shoes to match, make alterations, etc. To insure that all dresses are free of manufacture defects or damages, we personally inspect all dresses being shipped. This is to make sure that every dress is in perfect condition when it arrives to you. Ship dates given to us by manufactures are estimates and will not be guaranteed. In the event that a manufacture cannot fulfill an order by the wear date, you will be notified immediately and money refunded to the card charged. Each designer uses a different size chart. 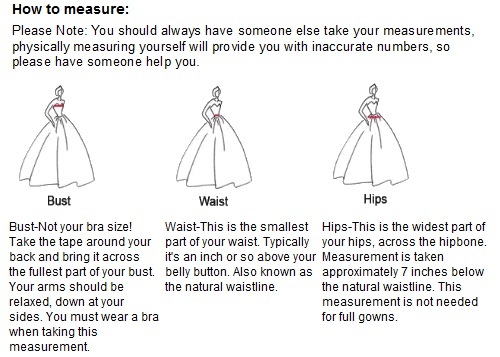 Please use the size chart for the dress you are wanting and measure yourself to be sure you are picking the right size. If you do not do this, your dress will most likely not fit. Also you need to plan on having alterations done when you receive your dress; about 80-90% of all customers have to have some sort of alteration done to their dress for it to fit properly and how they would like. Plus the dress may even need to be steamed of wrinkles that occur during the shipping process. The security of your credit card and personal information is a top priority with us. We strive to make your online shopping experience an enjoyable and safe one . When you place an order with us online, your order information is protected. You can rest assured that we are taking steps to make your transaction confidential and secure.